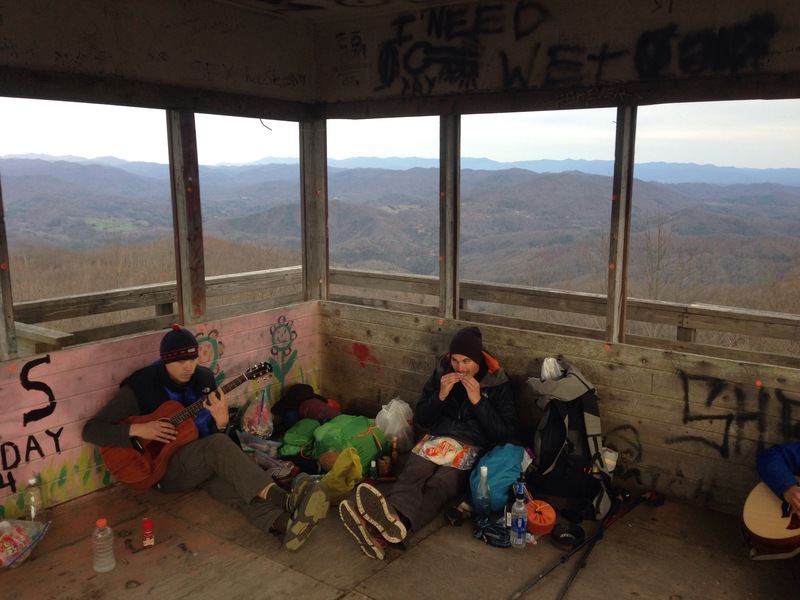 After escaping Hot Springs Team Mudslide slept on top of Rich Mountain Fire Tower, old and poxed with graffiti. We ran into another group calling themselves Team Liar, because they lie all the time, and they pulled out a melodica and travel guitar. We had a good fire tower jam session in which I played my pot-drum. Day 30 we covered 13.4 miles. A lady gave us a bag of cross-shaped Easter cookies that PeaceDawg, being Jewish, pretended were plus and minus signs. Day 31 Kyle initiated his new hiking strategy: with his new pack and guitar he would start out extra early, get to camp early, and spend the afternoon practicing guitar. He was feeling he wanted to be making better use of all this time spent in the woods. Kyle is an excellent guitar player already, so his practicing was serious. Unsure if we would see Team Mudslide all together again, I said a semi-goodbye the night before and left early with Kyle. 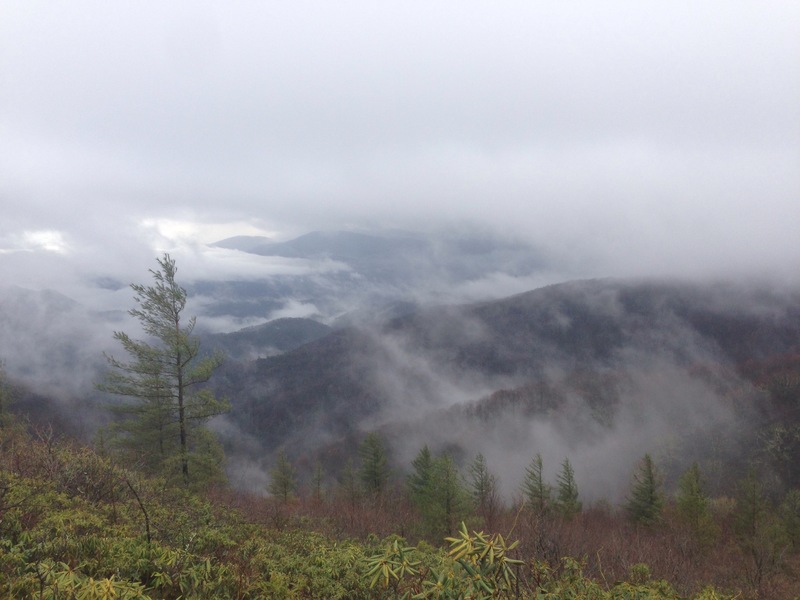 The morning was misty and damp; Kyle pulled off far ahead of me and I hiked alone over a rocky ridge. 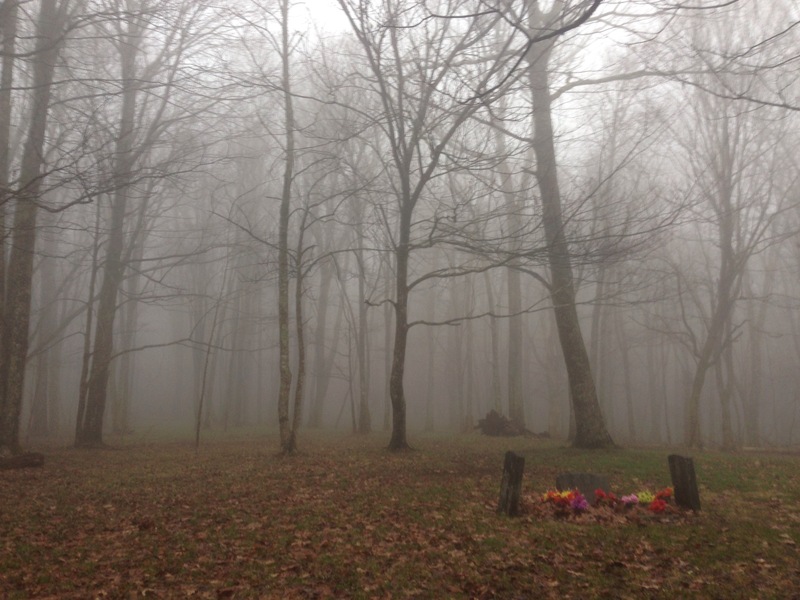 I stopped by a graveyard for a snack and soon after a roll of thunder sent the rain down. I pulled into the shelter—where Kyle was waiting—completely soaked. 11 miles we decided was good enough, and set up camp. Sure enough, Team Mudslide caught up later that night and I borrowed PeaceDawg’s chessboard to play with a guy named Will and an Austrian named Bane. If I’d known how many people would be willing to play out here I’d have brought a board myself! Next morning we started out early again (early being around 8/8:30, typically we’ve been getting out 9:30/10). Rolling hills took us up and down and up and down again, until we followed a sign for some tremendous trail magic. A former hiker (forgot to write down his name!) cooked up some huge plates of scrambled eggs and hash browns for us. That, on top of the lunch I just ate, left me so stuffed I had to take it slow up the next hill. We camped with Will, a computer scientist dreaming of designing his own video game after the trail gives him the self-discipline and momentum he needs, and Kyle played some guitar in his tent. The next day we covered a solid 17 miles, and for the first time with some decisiveness Kyle said he wanted to get off the trail in Erwin, the next town. I’d been afraid this was coming. He’d said a few times before that he wasn’t sure the AT was for him; I didn’t mention it here because it’s a touchy subject. Kyle was eager to get started with some other life plans. A month of hiking had been enough. My head swirled with thoughts about why anyone hikes the trail, why I hike the trail, and I attempted to convince him to stay. 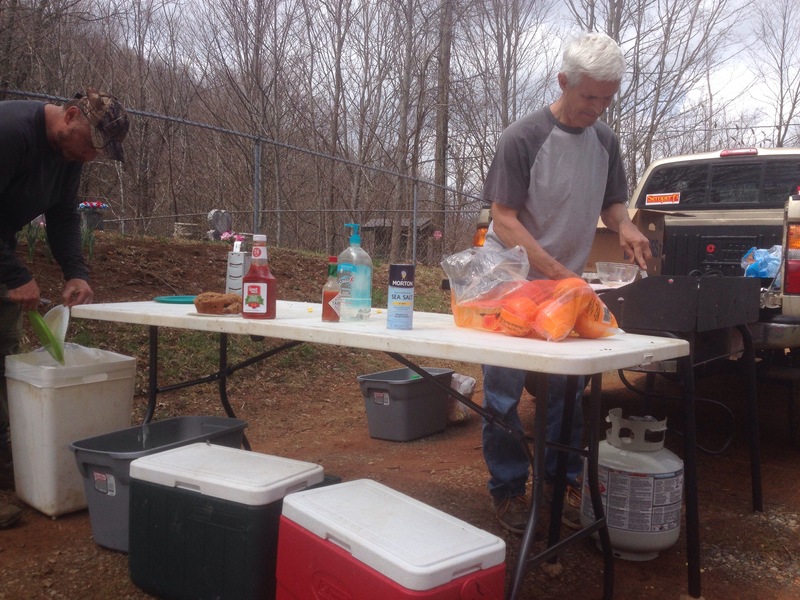 But on day 34 we arrived in Erwin and his mind hadn’t changed; he bought me lunch at an all-you-can-eat pizza buffet. The question became how he would get back to our parents’ house in Winston-Salem; he wanted to surprise them. Some technicality prevented him from getting a rental car, which left the Greyhound bus in the next town. But how would he get to the next town? We knew of a certain legendary person on the trail named Miss Janet. 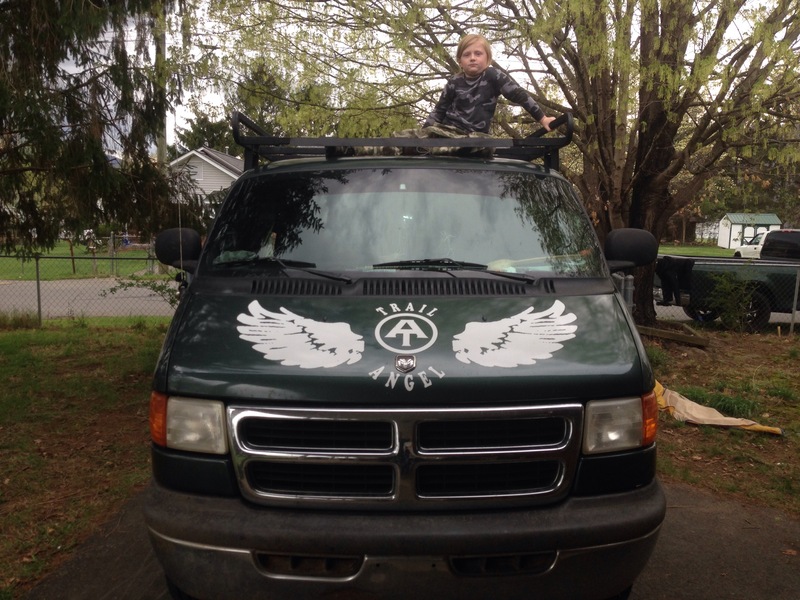 She drives around a big green van helping hikers get from here to there, asking for donations. She is the definitive trail angel, and everyone keeps her phone number as a standard safety-net and resource. We’d heard Team Mudslide had ridden with her into town, and sure enough when we got in her van PeaceDawg, Dancemove, and Turbo were there, along with hikers named 5, Seinfeld, Heyo, and Fynn. Miss Janet said we were being kidnapped and took us to Walmart before driving us to a house in Erwin (her late uncle’s house, or something like that, now a hiker pad; Miss Janet lives mostly from her van). We all bought ingredients to make a huge burrito dinner, complete with margaritas and beer. We had an awesome night with another jam session in the living room. Miss Janet’s daughter’s family joined too, including her grandson Ian who showed me both the easy and the hard way to climb on top of grandma’s van. It was a good night to send Kyle off. I couldn’t help but hope the specialness of it would make him change his mind. But the next morning Miss Janet took him to the Greyhound station, and I was left disoriented, northbound, alone.